Article: What's the most useless space in your warehouse? A common warehouse problem: empty and loose pallets cluttered around your loading dock. This isn't only an aesthetic problem; it's also a safety problem and an operational inefficiency, since pallets, empty cartons, or packing materials are bulk items that can consume significant amounts of floor space or picking rack space. 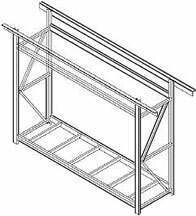 Over-Dock storage racks help solve this problem by storing your empty pallets, pack materials, or cartons in racking above your loading dock doors, where space is often left unused. Steel King SK2000 or SK3000 high quality racks make the system work. 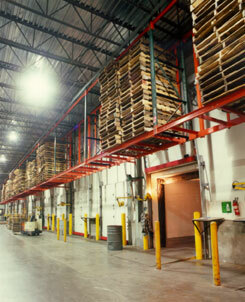 Since lift trucks are an issue in these areas, the racks are configured to reduce the chances of a forklift impact. We offer two distinct designs: Single-Leg Design & Ceiling Supported. The single-leg design uses an upright frame with a special offset, and a single upright column that clears your door height. Heavy-duty wall ties stabilize the frame. Wall tie and beam length are varied to clear your doors. Design adds no load to your roof structure. Single-leg, wall-tied systems are best suited for buildings with poured concrete walls or exposed-column buildings. Beam lengths also vary to clear the door. The front post, where most potential damage occurs, is removed. The single-leg, wall-tied design is anchored to the floor with 4 bolts. The rack system needs to be secured with heavy-duty wall ties. Each wall tie is bolted to the rack column and anchored to the concrete wall or exposed building column. The ceiling supported over-dock racking system must be designed in conjunction with the building architect who must verify the adequacy of the building to support the additional weight of the racking and the pallets. Since the structural cross bars of the rack frames of the suspended system are field welded or bolted to the roof trusses or girders, the system is suitable for buildings with any wall type. 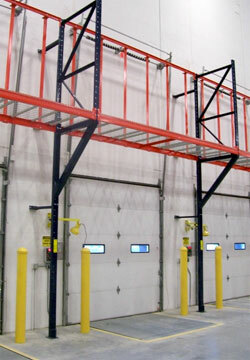 The suspended over-dock storage rack does not have lower legs; there is no interference with forklift or other traffic. 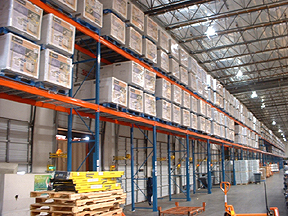 Some warehouses can accomodate full uprights that will hold heavier loads with varying capacities. Contact us about these rack applications. 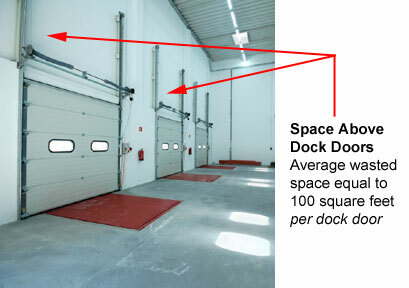 Contact us for assistance with your over the dock door storage project. 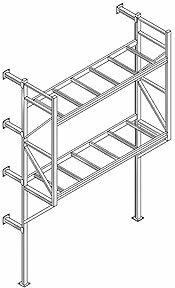 We can help you design exactly the right racking system for your application.